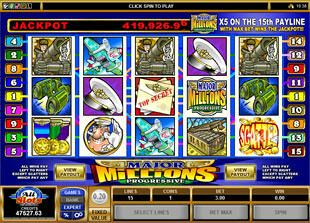 Major Millions Slots is 5 reel, 15 line game produced by Microgaming. Resilient major will present you lots of adventures and cash prizes such as top jackpot of 8,000 coins or $1,600 and unpredictable progressive jackpot. You can play this slot in no download format without using special software installation. Try 3 reel Major Millions 3 Reel slot as well. 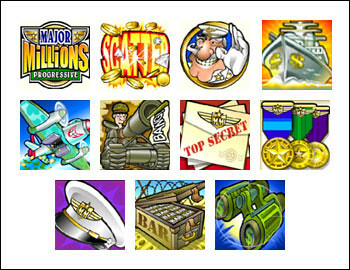 Major Millions Slots has following symbols: Major, Ship, Plane, Cannon, Top Secret, Medals, Service Cap and Binocular. Special symbols of the game are: Major Millions and Golden Pieces. This progressive slot machine has fixed coin size: $0.20. The minimum bet is 0.20, the maximum one is $3.00. The highest major jackpot is 8,000 coins or $1,600 for 5 Major Millions symbols. The second major jackpot is 1,000 coins or $200 for 5 Major symbols. The third major jackpot is 800 coins or $160 for 5 Ship symbols. The wild symbol of the game is Major Millions. It substitutes for all symbol of the game, except scattered Golden Pieces. 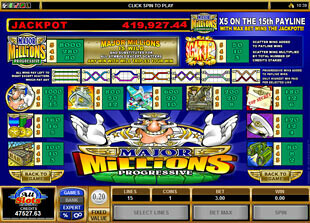 Your win will be tripled if Major Millions symbol emerges in the winning combination. Mind that this symbol acts on the active lines only. The scatter symbol of the game is Golden Pieces. All scatter wins pay independently on your active lines. To count any scatter win you should multiply your current bet by corresponding scatter award. For example, to count the maximum scatter win, you should multiply maximum bet of $3.00 by maximum scatter award of 50 coins that constitutes $150. Major Millions Slots has prepared a great surprise for you – unexpected progressive jackpot. To win progressive jackpot you need to catch 5 Major Millions symbols on the 15th line and on condition that you play maximum bet. Major Millions slot machine is unusual game that invites you to meet with funny major who will share with extremely big progressive jackpot.